Motorola released the 2nd Generation Moto X in September. This model is available in 16GB and 32GB model variants, in black or bamboo. The device does not support external memory but has a 2GB RAM as well. 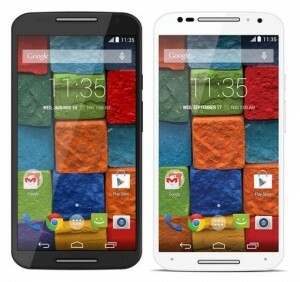 The Moto X was released on Kit Kat which will be upgradable to Lollipop in the near future. This device also features a 5.2″ AMOLED touch screen with Corning Gorilla Glass. The phone itself is waterproof. The Moto X has a 13MP camera with dual-LED flash and HDR, 2160p camcorder and 2MP front-facing camera. Perfect for selfies at any time of the day! It also has a quad-core, 2.5 GHz processor with Adreno 330 – providing fast browsing and impeccable gaming experience. Exclusive to the Moto X is Quick Charge 2.0 (fast battery charger) which can charge up to 60% battery in just 30 minutes! This device is perfect if you’re always on the go! Unlocking your Moto X is fast, simple and 100% guaranteed by Cellunlocker.net. Why Unlock your Moto X with Cellunlocker.net? Unlock Your Motorola Moto X Today!